Anytime zoos around the world have a パンダ (panda), it’s almost certainly being rented from China. China doesn’t usually give pandas to other countries for free…but charges huge annual fees to cities that want the animal in their city zoo. Many cities agree to this because having exotic animals such as pandas draws visitors to the zoo. 「上野動物園」 (Ueno Zoo) in Tokyo get their first panda from China in 1972 and has had at least one panda at the zoo since then…that is, until 2008 April 30 when the single panda that was there died. That panda’s name was 「リンリン」 (Ling-Ling). He died at the age of 22 almost two years ago. Click here to see the post I wrote about it. Ling-Ling (R.I.P.) resting at Ueno Zoo in Tokyo a few years ago. After Ling-Ling died, China asked Tokyo if they’d like to rent a replacement. The Tokyo Governor Ishihara said the fee was way too steep and the zoos in Tokyo don’t need pandas to attract visitors. So he declined. But it seems that visitor attendance at 「上野動物園」 (Ueno Zoo) has seen a sharp decline since it’s been “panda-less”, and many Japanese people have expressed a wish for pandas to return to the zoo. So the governor of Tokyo agreed to pay China an annual fee of nearly 8千5百万円 (¥85 million)…which equals US$950,000 for two pandas beginning next year. 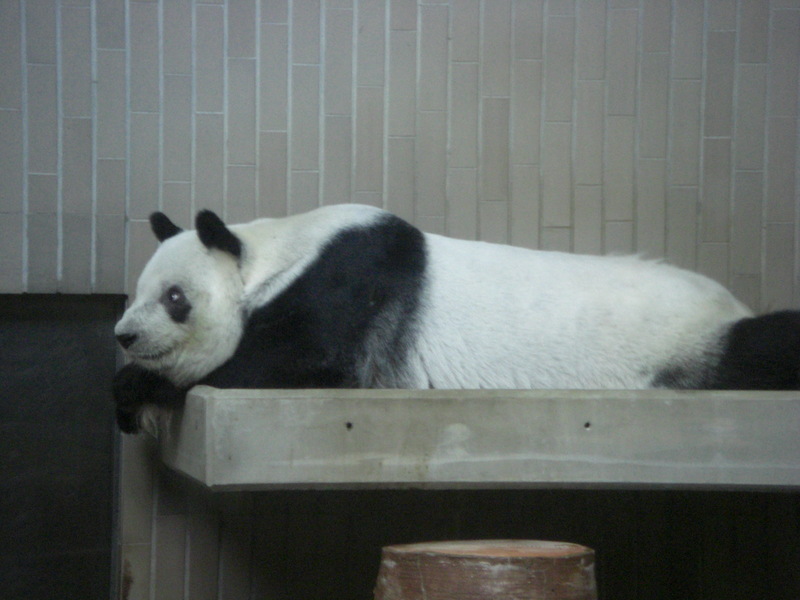 So if you will be in Tokyo in 2011, you’ll be able to see pandas at 「上野動物園」 (Ueno Zoo). By the way, if you like zoos…there are a number of very nice zoos in the Tokyo area. Ueno Zoo is conveniently located downtown…but it’s not the best zoo in Tokyo.